Condition of Artwork: On close inspection there is a slight tear towards top left corner of artwork. Overall, this remains a fine example of Eastwood's work. Notes: URN: 3.18. 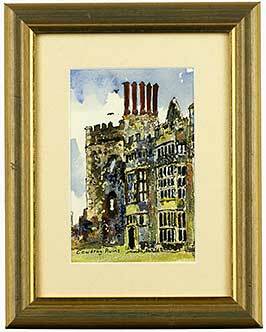 An Original Watercolour Painting on paper by Francis Hurst Eastwood. Created circa 1880 by the British born artist. The image measures 52 x 35 cm. This artwork has been bespoke framed and glazed, with a lined mount, in an attractive gold frame and with hanging attachments on the back. The framed size is 72 x 56 cm.